Gary Pinkerton has this special 4th of July episode with Julie Ziglar Norman, daughter of legendary motivational speaker Zig Ziglar and current motivational speaker, as the two discuss her experience in real estate, overcoming her husbands issues with credit cards and alcohol, and the empire that her father Zig created and she continues with her family. But first Gary starts the show discussing the Declaration of Independence and the Constitution and why a government that changes slowly is still the best one out there. 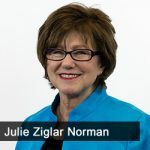 [36:11] What method of Zig’s does Julie hear about most often from others?